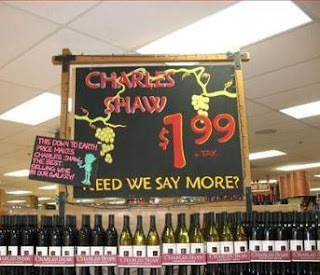 The best way to end the week and start the weekend is with a nice bottle of wine from Trader Joe's. Trader Joe's has a large selection of wines to choose from, but when push comes to shove, it's hard to deny a $1.99 bottle of Charles Shaw. It may not be the fanciest wine in the market, but it definitely does the job in helping you relax after a long week. Or having a dinner party? Toss a bottle or 2 in a decanter and your friends will never know it was only $2! Oh yeah, don't forget, in moderation, wine offers a multitude of health benefits along with being a great antioxidant! Call me skinny, but should I go with a red or a white?